upper side of the leaf is green with the underside being dark purplish-red. They have an extensive root system that does not anchor it to the substrate. It is a free-floating plant with leaves that sit on the water’s surface. 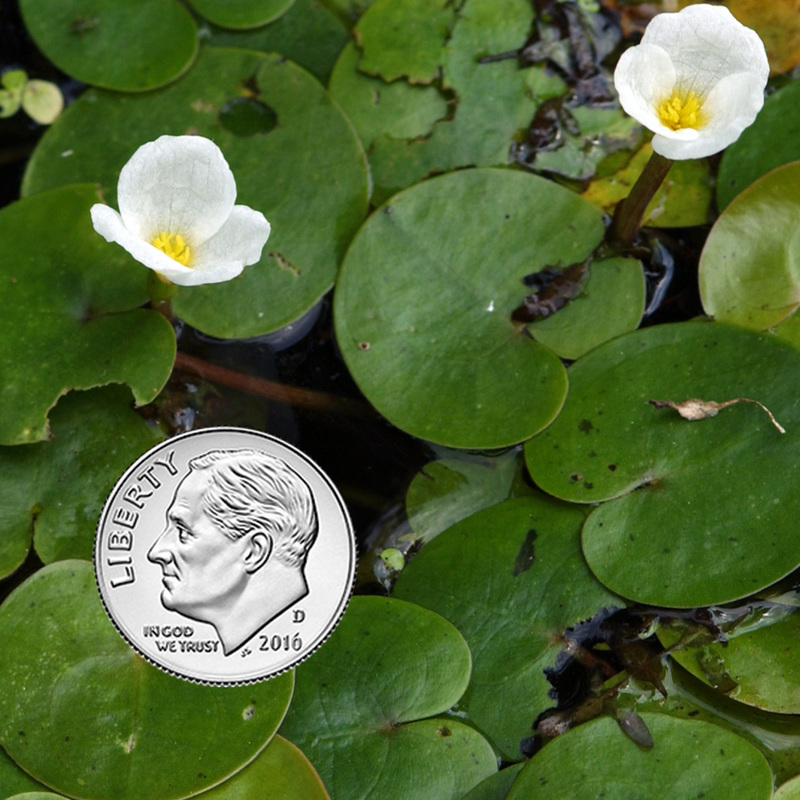 Frogbit produces a single white flower that is 1.5 cm wide and it has three petals. Hydrocharis morsus-ranae, better known as European Frogbit, is an aquatic, invasive species currently spreading throughout the Great Lakes Basin. Initially introduced from Asia and Europe as a potential commercial ornamental plant to the Arboretum of the Central Experimental Farm in Ottawa in 1932, frogbit soon escaped and began growing in the wild in 1939. The plant spread throughout the Ottawa River, the Canadian shore of Lake Ontario, the St Lawrence River, and then to smaller tributaries of the St Lawrence in New York. In recent years, the plant has made its way down Ontario’s south shore, Lake St. Clair, and the Detroit River. Recent sightings have also been made in the Alpena area. ​ but much smaller in size. The 1/2 inch leaves are approximately the size of a dime. They are smooth, leathery, and have heart-shaped bases. The fast-growing plant forms thick mats that reduce biodiversity by crowding out native plants and preventing sunlight from reaching submerged plants. When a large colony of the plant dies and decomposes it removes oxygen from the water, which can affect fish communities and other aquatic life. Dense masses of European frogbit can hinder swimmers and boaters, prevent other recreational uses of waterways, and clog ditches and streams. Currently there are very few ways to manage frogbit. It seems that hand removal only temporarily eliminates the plant. For smaller infestations, physical removal of the plant in its entirety (including all plant parts and roots) can be effective. You can help prevent the spread of the plant by thoroughly washing your boat, trailer, and other equipment that travels in between water bodies with you. Be sure to drain all water from boat motors, live wells and bilge. Bait should be released on land or in the trash, never into water bodies. Fish and bait should never be moved between water bodies, as well. You can help stop the spread of this invasive by spreading your knowledge to others! Furthermore, using native plants in your garden is always a better alternative than raising introduced species. 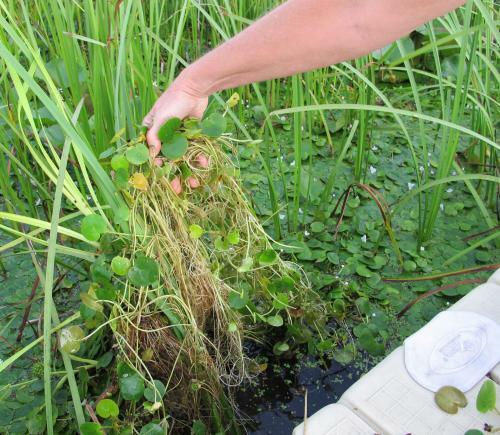 If you believe you have found invasive frogbit (or another invasive species), you can report the sighting to Tip of the Mitt Watershed Council at (231) 347-1181 or e-mail info@watershedcouncil.org. 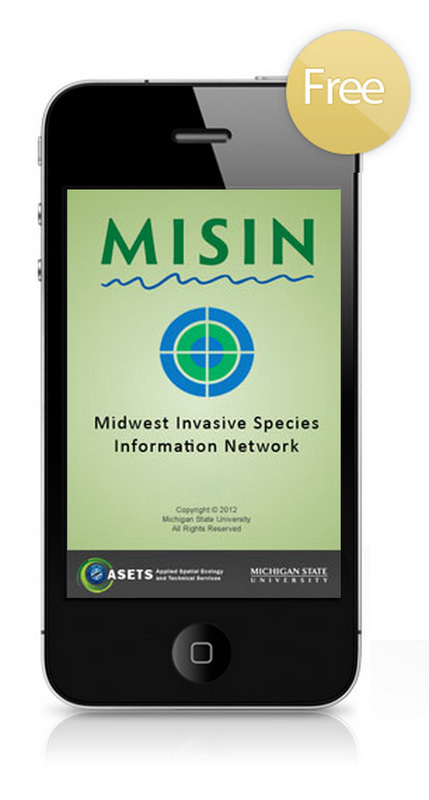 You may also report invasive species using the free mobile smartphone app from Midwest Invasive Species Information Network (MISIN).